PHUKET: Phuket City Police are moving forward with a plan to have disabled people monitor closed-circuit television (CCTV) security cameras, but the project will be limited to those who can get up the stairs to the fourth-storey CCTV control room on their own. 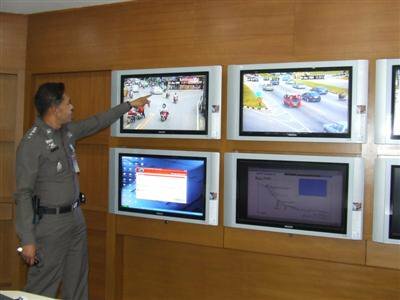 Phuket City Superintendent Wanchai Ekpornpit told the Gazette yesterday that his department is working with the Phuket Provincial Administration Organization (PPAO) to screen applicants to monitor existing CCTV cameras, as well as 53 more units funded by the PPAO expected to be operational by the end of the month. Plans to use teams of nine disabled people at a time, working in shifts to monitor the screens, were announced in early November. However many members of the Phuket Disabled Peoples’ Club who would like to take part are wheelchair-bound or otherwise unable to get up the stairs. As Phuket City Police have no budget to install an elevator, Col Wanchai said his department is working with the PPAO and Don’t Drive Drunk Foundation to find volunteers capable of getting up the stairs on their own. “The project will get underway soon, probably next month,” he said. Phuket Disabled Peoples’ Club President Sawai Promjinda said his group had yet to receive any information about the project, however. “I think it is still in the public relations phase,” he said. Although the project will begin in Phuket City, the PPAO would eventually like to expand CCTV coverage across the island and have disabled volunteers working in each police precinct. Chalong Police District has been mentioned as the next target area. Col Grissak Songmoonnark, Superintendent of the Kathu Police, which has jurisdiction over Patong, told the Gazette earlier that volunteers would need considerable training in how to use the technology. This includes camera zooming and tracking of suspects to ensure high-quality images are obtained. “It’s not just a matter of staring at a monitor all day,” he said.